Photo courtesy of "350 Days"
Last year, American pro wrestling fans had a “must-see” one-night event when the documentary 350 Days hit movie theatres nationwide in July. Starring former world champions Bret Hart and “Superstar” Billy Graham, the documentary provided a behind-the-scenes look at the gruelling life that many professional wrestlers led on the road and the subsequent effect that this lifestyle had on their marriages, families, and overall health. On April 2nd, 350 Days -- which also has exclusive interviews with Greg "The Hammer" Valentine, Tito Santana, Paul “Mr. Wonderful” Orndorff, Abdullah The Butcher, Wendi Richter, Bill Eadie, Nikolai Volkoff, Lanny Poffo, Stan Hansen, Angelo Mosca, and Lex Luger -- gets its DVD and video-on-demand releases. 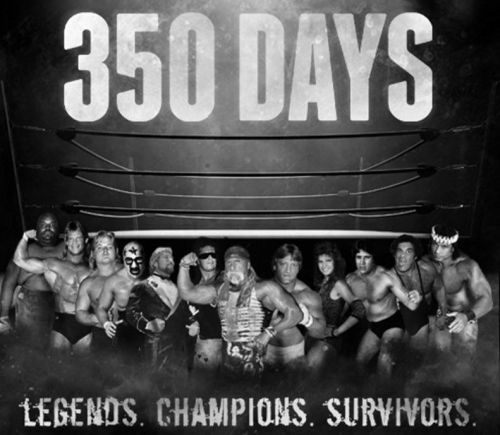 350 Days also has the distinction of having some of the last interviews ever done with George “The Animal” Steele, Jimmy “Superfly” Snuka, Ox Baker, “Pretty Boy” Larry Sharpe, Don Fargo, and Angelo Savoldi. To learn more about 350 Days, I spoke with the film's director Fulvio Cecere. More on 350 Days -- which can be pre-ordered via Apple -- is at www.350daysthemovie.com. I had the pleasure of seeing 350 Days in the theatrelast year. Is it the same movie on DVD or VOD? Were any changes made? Fulvio Cecere: Yes, it is the same movie but I have been working on a Director's Cut. We interviewed 72 people but only 38 made it into the movie. So there is lots more footage! For a lot of directors, the film is truly crafted in the editing room. Did you know that the first would be about the 350 Days concept when you started filming? Or did it evolve into that? Fulvio Cecere: The idea was always to tell the story of life on the road for all the wrestlers who lived through the 350 Days era, but it was also a constant evolution. We'd interview one person, and then we would meet another that we thought would be helpful and it evolved into 22 days of shooting. We had no idea it would be that encompassing. Who was the first wrestler that really got onboard with the film? Fulvio Cecere: We had four that came on board and we shot them all on the first weekend. It was Tito Santana, Superstar Billy Graham, Greg "The Hammer" Valentine and Angelo Savoldi, at the time, the oldest living wrestler at 99 years old. Given that some of your team also worked on The Wrestler, I'm assuming that you were well-versed in the wrestling world before making 350 Days. But did you learn anything new about wrestling as a result of making this film? Fulvio Cecere: Evan Ginzburg, who was our Associate Producer was also an Associate Producer on The Wrestler and has been a wrestling fan most of his life. Darren Antola, who came up with the idea of doing a movie about 350 Days, was and is a huge wrestling fan. So I would say they were very well-versed. However, I, as the director, was not. I had watched wrestling as a kid growing up in Montreal, Canada and I wrestled in high school but I really had no idea about wrestling. I came on-board strictly as a filmmaker. And yes, I learned so much as a result of directing this movie. I have a total appreciation and respect for what these men and women did. And in doing my research, I had no idea of its roots and history but I now have a newfound love for it. It was really eye-opening. These people were artists. Wrestling today seems to be different in every way possible from that of yesteryear, from the level of athletics, to the in-ring psychology, to what aspiring wresters know about the business before entering in, and so forth. When you hear a "wrestling isn't as good as it used to be" sort of conversation, how do you feel? Fulvio Cecere: I'm not sure how to feel about because, as I stated, I really wasn't a fan prior to directing the movie. But I've seen lots of footage, documentaries and photos from yesteryear and I know how good the wrestling used to be. For example, I saw a photo of 6' 9" Don Leo Jonathan dropkick a seven-foot Jean Ferre, later Andre The Giant -- let that sink in! But then when you look at what's going on with Ring Of Honor and New Japan, that athleticism is insane. Looking forward to seeing Chris Jericho and All Elite Wrestling. I think when you hear those conversations it's mostly about storylines and you can argue that there have been some silly ones of late. Are there any wrestlers today who you really feel get the work ethic or coolness exemplified in 350 Days? Fulvio Cecere: I would definitely say Chris Jericho. I could see John Cena doing that lifestyle. Greg Valentine is out there hustling and so is Tito Santana. And I'd give a shout-out to Andrew "The Reinforcer" Anderson, who's still carrying the torch. Do you have plans to helm another wrestling-related documentary or project? Fulvio Cecere: At present, I'd like to release a "Director's Cut" of 350 Days. I also have several other TV and movie projects in the works that would be a great fit for some pro wrestlers. 350 Days aside, what is coming up for you? Fulvio Cecere: I have a Western I'd love to do. I also have an action adventure, a TV military drama and some reality-based ideas. And I'm still constantly auditioning. Not giving up the day job yet! Finally, Fulvio, any last words for the kids? Fulvio Cecere: Watch this movie and see what these older legends went through. These are the roots of wrestling. These men and women were the reason it is what it is today. Learn from them, never forget them, be the new them.